Pitching in the minors this spring has been stupendous at times. From AAA Iowa on down to class A South Bend. Depending on the day, you could see almost any pitcher throw a one or two-hitter with 8 to 10 Ks. You never know. However, stringing together a series of consistent starts has been hard to find. Last month, Matt Swarmer did it for Myrtle Beach. This month, that distinction falls to Erich Uelmen of South Bend. When the Cubs announce their Pitcher of the Month for May next week, Uelmen should be at or near the top of the list for consideration In fact, unless a miracle happens, Uelmen is going to be named to Cubs Central’s All-Star Team for May on Friday. For the month, Uelmen made five starts going 25 innings. He struck out 25 while holding opponents to a .232 average and only walking six. In April, you would not have recognized Uelmen. His ERA of 9.75 was marked by a .320 batting average against and a WHIP of 1.92. In May, his WHIP was 1.12 and Uelmen has not allowed an earned run since May 11. That’s a pretty impressive stretch. Add in a 3-to-1 ground ball to flyout ratio and Uelmen begins to look very promising. After Uelmen was drafted and signed in 2017, he spent the rest of the summer at Eugene in short season ball. I only remember seeing him pitch a couple of times. I try not to put too much stock into a signed starter’s first go around. But Uelmen threw 17.2 total innings, all in relief, and gave up only 4 earned runs (2.04 ERA) while striking out an outstanding 23 batters. 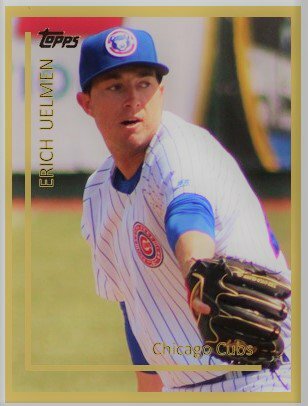 Over the winter, MLB Pipeline ranked Uelmen at #17 on the Cubs’ Top 30 Prospect List. Here is what they thought of Uelmen. Uelmen pounds the bottom of the strike zone with a heavy 90-94 mph sinker that has the Cubs wondering if he might be the second coming of Derek Lowe. They’re going to have him add a four-seamer he can elevate to change batters’ eye level. He can get some swings and misses with his average slider but he needs more work on his changeup. Uelmen operates from a low three-quarters arm slot and has effort in his delivery, so some scouts project him as a reliever. Chicago will develop him as a starter, believing that his athleticism and strike-throwing ability can keep him in the rotation. He could succeed as at least a middle reliever with his sinker, giving him a nice fallback and one of the higher floors among its recent college pitching selections. Pipeline’s Jim Callis and Jonathan Mayo make an excellent point that Uelmen needs to add a 4 seamer to offset his plus sinker. What I have seen this month from Uelmen is that he is pitching off that sinker more and more. I am not a big radar gun guy. Yes, sometimes it is flashy to see a guy throw 95-97, but I like to watch the type of swings a pitcher gets. For Uelmen, he gets some of the ugliest swings off the sinker. Most hitters will flail over the top or make weak contact. However, Uelmen still needs to work on his other pitches. He has a changeup and a slider to go along with his sinker. While Uelmen has put up an excellent month, it is just the beginning of his Cub career. He’s not going to be fast tracked to the majors anytime soon. But another month like May and you have to begin to wonder if he will see Myrtle Beach this year. It’s a possibility. After all, his FIP is 2.87 on the year. In the end, though, for Uelmen it has to be about developing that consistency from start to start and month to month. He’s had a nice three week run in May. He just needs to keep it going.